Sysdig, Inc., a San Francisco, CA-based cloud-native intelligence company, raised $68.5m in series D funding. The round, which brought total funding to date to $121.5m, was led by Insight Venture Partners, with participation from previous investors Bain Capital Ventures and Accel. The company intends to use the funds to extend its business reach. Led by Suresh Vasudevan, CEO, Sysdig provides enterprises with an intelligence platform to operate reliable and secure containerized infrastructure and cloud-native applications. The company’s cloud-native intelligence platform was built with an understanding of the modern DevSecOps workflow across Kubernetes, Docker and both private and public clouds. Its open source forensics technology, called Sysdig, and its open source security project, Sysdig Falco, have a community of millions of users, and provide the foundation for a rich, commercial product set. Dozens of Global 2000 enterprises use the platform, including many of the world’s largest financial institutions, media companies, cable companies, technology companies, and government agencies. 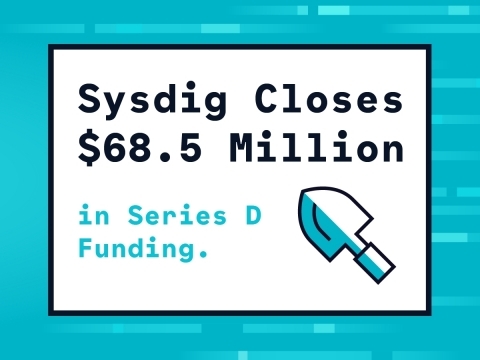 With Sysdig Secure, launched in October of 2017, the company made its cloud-native intelligence Platform the only solution to offer unified security, monitoring, and forensics with native Kubernetes and Prometheus integration for containers and microservices. Sysdig recently opened second headquarters in Raleigh, North Carolina, which added to offices in San Francisco, Belgrade, and London.